Plant clusters govern soil microbiology in desert systems. Female Acanthosicyos horridus plants in the Namib Desert are preferentially accessed by grazers, especially during fruit availability. We hypothesized that this differential grazing affects the taxonomic diversity of soil bacterial populations. Sampling was carried out at three locations on a northwest-to-southeast transect starting at the Kuiseb Delta, near the shores of the Atlantic in the western Namib Desert, and extending inland over a distance of 140 km. Analyses of the soil samples showed that proximity to the sea had a strong impact on soil salinity. 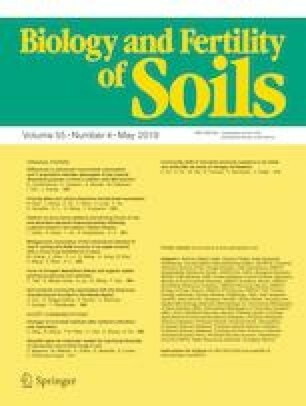 Soil pH and organic matter content were generally not significantly correlated with the presence or absence of plants and varied little and non-uniformly along the transect. A. horridus presence led to distinct under-canopy bacterial-community diversity in contrast with the non-vegetated spaces between shrubs. However, plant gender has only a marginal, statistically insignificant impact on the bacterial-diversity properties, thus not supporting our hypothesis. Therefore, the taxonomic diversity of the bacterial community in Namib Desert soils vegetated with A. horridus is primarily governed by the presence or absence of plants and by proximity to the ocean. The online version of this article ( https://doi.org/10.1007/s00374-019-01358-7) contains supplementary material, which is available to authorized users. Special thanks to Mrs. Sharon Victor for her useful comments and Ms. Tea Colin for her assistance in the laboratory work. We thank the members of the Soil Ecology Lab at Bar-Ilan University for valuable discussions and technical assistance. Our research did not involve human participants or animals. All authors agree to the submission of this manuscript.